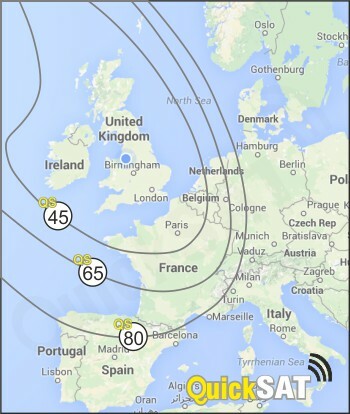 Most QuickSAT users are interested in receiving the UK channels (Freesat and SKY*) while on holiday in the UK and Europe, the coverage map below shows the typical reception area for these channels with out QS45, QS65 and QS80 products. The QuickSAT systems can also be used to receive foreign language channels from other satellites such as Hotbird or the Astra South Beam anywhere in Europe. satellites the main free broadcasters (BBC, ITV, etc) will require a QS80 as you travel further away from the UK. With the new satellites launched in late 2014 the Sky subscription channels and HD versions of ITV 2, 3, 4 & Channel 5 are available in a larger area than the free to air BBC channels, ITV1 and Channel 4 with reports indicating the QuickSAT 80 will work well into Northern Spain for those channels. We also have an interactive map of users reception reports here. The QS45 is our lowest cost touring satellite solution containing a 45cm dish which can be used to receive all the UK TV channels across England, Scotland, Wales, Ireland and into Northern France. Although it only measures 43cm in diameter, the QuickSAT QS65 has better performance than a 65cm conventional satellite dish and can receive the UK TV channels across England, Scotland, Wales, Ireland and over most of France and into West Germany. It can also be used with other satellites over the whole of Europe. The QuickSAT QS80 has the performance of an 80cm conventional satellite dish but only measures 624 x 624mm. It can receive the UK TV channels across England, Scotland, Wales, Ireland, over the majority of France and West Germany and into Northern Spain. The stronger signals from the Sky subscription channels and HD versions of ITV 2, 3, 4 & Channel 5 should be viewable well into Spain. As with the other dishes it can also be used with other satellites over the whole of Europe. Please use this map for general guidance onlyFurther information on coverage can be found on the official Astra website.Other satellites such as Astra South Beam, Hotbird etc can also be received with the QuickSAT system.